***CAR IS IN FANTASTIC CONDITION AND DRIVES SUPERB!! *** 30th JANUARY 2020 MOT (No Advisory's) + NEW SERVICE + NEW TYRES + NEW FRONT BRAKE DISCS AND BRAKE PADS+ 12 MONTHS AA BREAKDOWN COVER + 3 MONTHS NATIONWIDE MECHANICAL BREAKDOWN WARRANTY+ EXPERIAN HPI CHECKED + FULLY DETAILED INSIDE AND OUT. ***SERVICE HISTORY*** 1st @ 10,250 miles on 17/06/15 Arnold Clarke, 2nd @ 21,890 miles on 22/06/16 Arnold Clarke, 3rd @ 32,190 miles on 07/06/17 Arnold Clarke, 4th @ 39,040 miles on 29/05/18 Available Car, 5th @ 46,705 miles on 31/01/2019 BPG (AA Approved Garage). 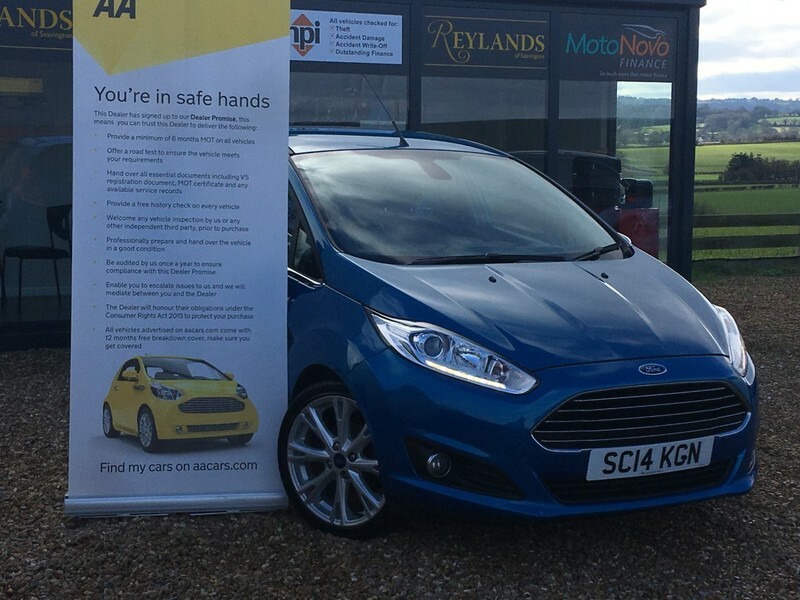 Reyland's of Seavington are pleased to offer you this absolutely stunning and TOP OF THE RANGE Fiesta TITANIUM X, finished in a very Rare striking Blue metallic. This Fiesta has a MASSIVE SPECFICATION including alloy wheels, rear spoiler, half leather seats, DAY running LED lights, rear parking sensors + Reverse Camera, front fogs, remote locking with key less entry, hands free telephony, heated seats, cruise control, Sony radio/cd/aux, air conditioning, and heated front and rear screens. This Fiesta is the Top of the range and drives superb, early viewing is recommended.